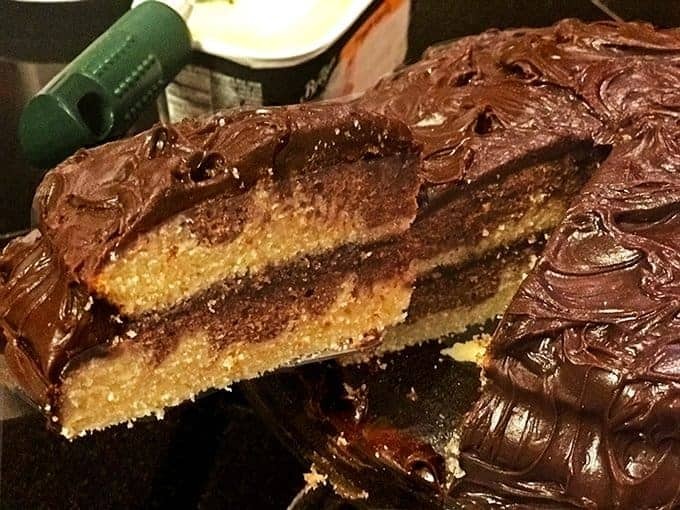 If you’ve ever wanted to know how to make a cake from scratch, this marble cake recipe is the one you are looking for. It’s so easy to make, even a pair of 12 year-old boys and their 14 year-old brother can do it. That’s exactly how this yummy birthday cake came about, read on to learn how they did it. Read on to find out how to make a cake from scratch. All six of our guys know their way around a kitchen. The four remaining at home range in ages from 12 to 15 and each one of them is pretty special. They are avid XBox players, good swimmers, great at catching fish and they love making recipes in the kitchen. All of them. I love having our boys help in the kitchen. Is it a little extra work? Maybe. Is it fun and fulfilling? Most definitely. 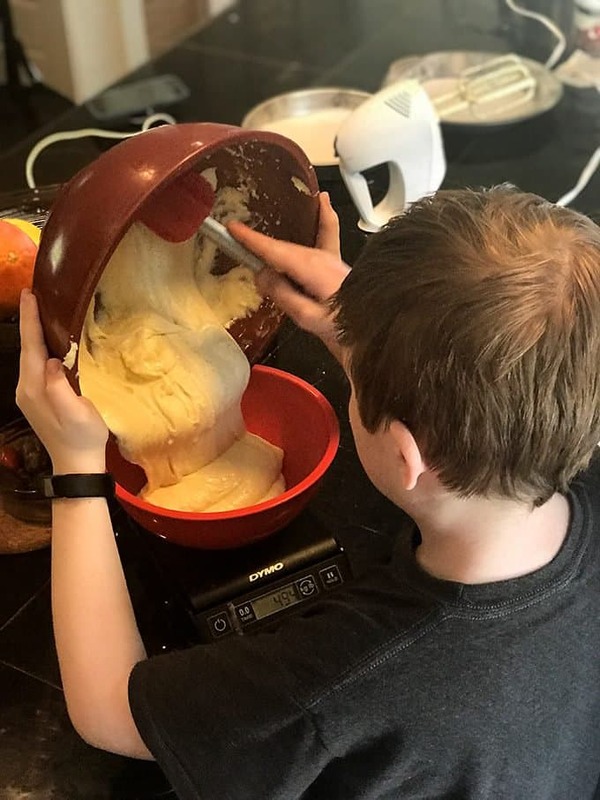 When the the latest birthday among them popped up, I was told in no uncertain terms by our 12 year old twins that they would be making the birthday cake and it would be a marble cake. I knew better than to object. Using a little thought and basic kitchen safety and baking technique, the Platter Talk kids will show you how to make a cake from scratch. I always try to cover the basics when working with our kids in the kitchen, even if they’ve heard it 100 times before. 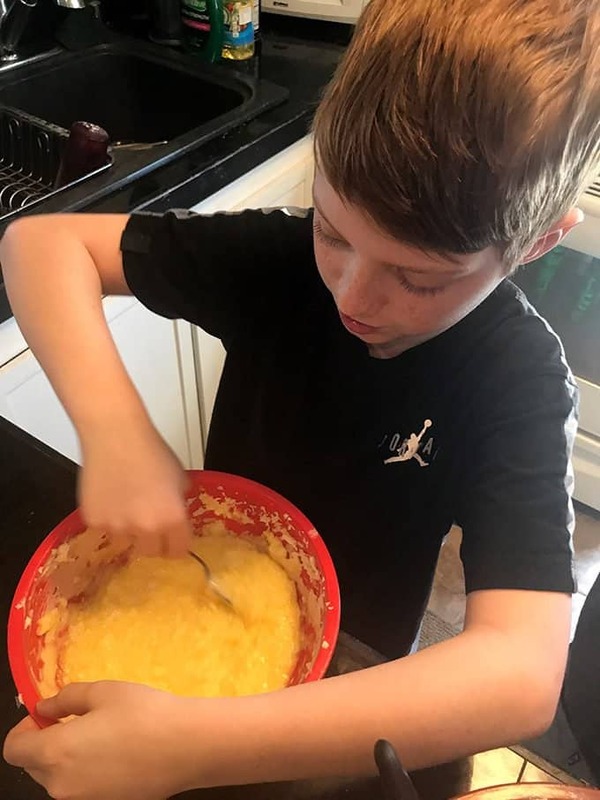 One of the things that I especially love is when we are making a recipe and they “take over”, demonstrating on their own how bake or cook something. As with almost anything that goes in the oven, first things first: Getting the oven hot by preheating it to the correct temperature. Preheating an oven is one of the very first things you need to do when making a cake from scratch. It might sound basic to you but preheating the oven is one of the first things you need to do when making a cake from scratch or baking anything else for that matter. 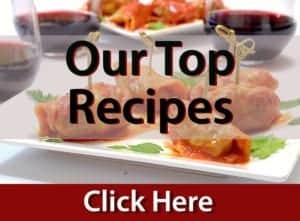 What’s the first thing to do when making any recipe? Make sure you have all the required ingredients! In terms of the oven though, the correct temperature is extremely important. 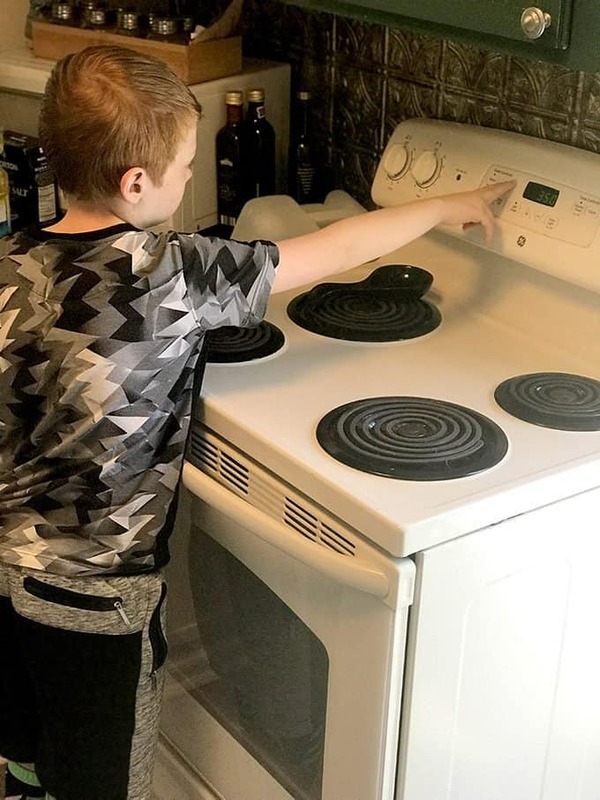 If you have an older oven, you may want to invest in an inexpensive oven thermometer that you can hang from one of the racks inside of your oven. Many ovens, both old and new, might run a little hot or a little cool. A small oven thermometer will tell you exactly what the actual temperature is inside of your oven. 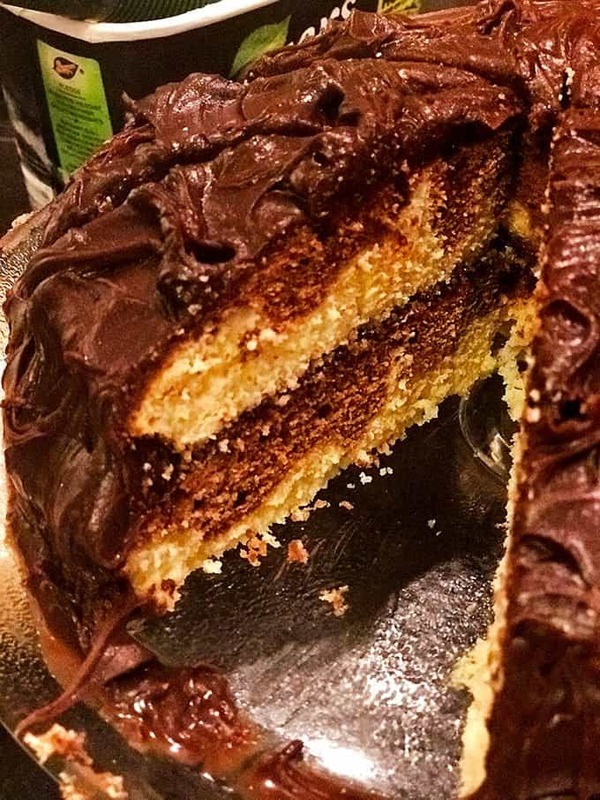 For this marble cake, the boys use two round cake pans to make a layered birthday cake. 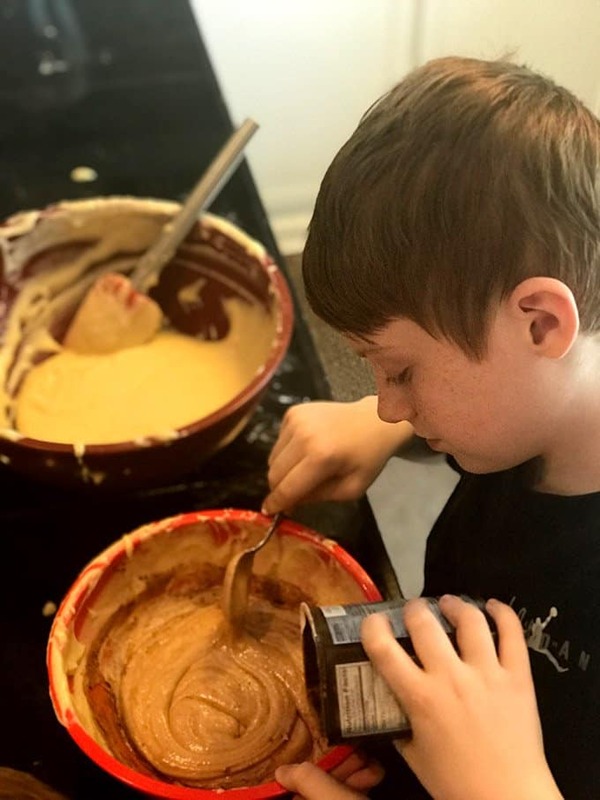 The boys made this marble cake recipe into a layer cake, by placing the batter in two separate round cake pans prior to baking. Before pouring the batter though, the pans need to be prepped with a light dusting of flour and then the boys place parchment paper in the bottom of each pan to help prevent the cake from sticking. See our post on how to grease a cake pan, to learn exactly how to do this. 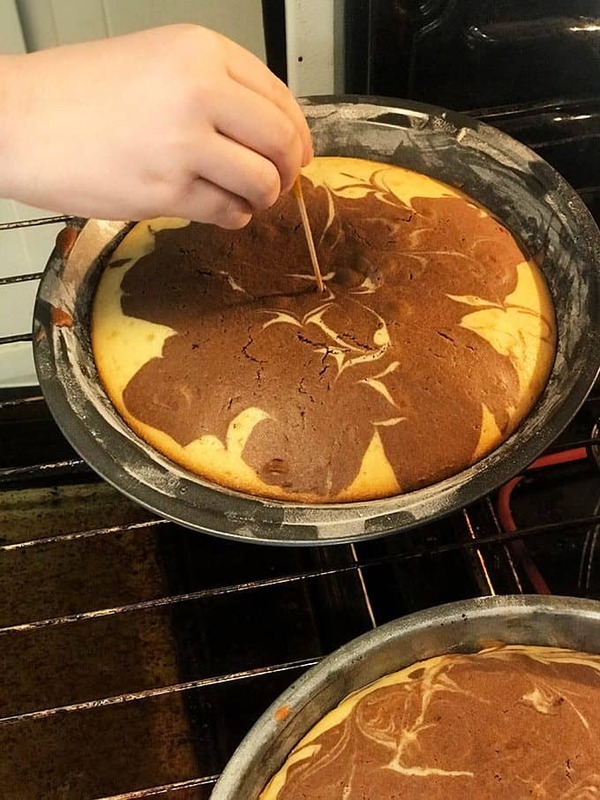 When making a layer cake such as this marble cake from scratch, you need to properly prep the cake pans so the batter won’t stick. With all good cake recipes, it’s important to properly prepare the pans. Cake batter an be sticky stuff, especially when it’s time for the cake to come out of the pans after they are cool. To help make sure the cake does not stick to the pans, here is what you need to do. Lightly grease the cake pans. Dust the cake pans with flour. Use parchment paper to cover the bottom of the cake pan. Place cake pan on top of parchment paper. Use a pencil to trace around the bottom of the cake pan. Use a kitchen scissors to cut the parchment paper pattern. Place cut-out parchment paper in bottom of cake pan(s). What do eggs do in baking? Almost all cake recipes from scratch use eggs. If you’ve ever wondered what do eggs do in cake, they add their own oil around the protein fibers of the flour, making the cake texture less “bready” and more tender with a short crumb. Eggs also act as a binding agent, helping to hold the cake batter together. When a recipe calls for eggs, always crack an egg open (one at a time) into a separate bowl, before adding it to the rest of the ingredients. If the egg is bad or you get a piece of shell in it, you can just toss it out without ruining the rest of the ingredients. When making this marble cake recipe, add the eggs one at a time. It’s important not to over-mix the cake batter when adding the eggs. When mixing the cake batter, after the eggs are added, it’s important to not over-stir the cake batter. 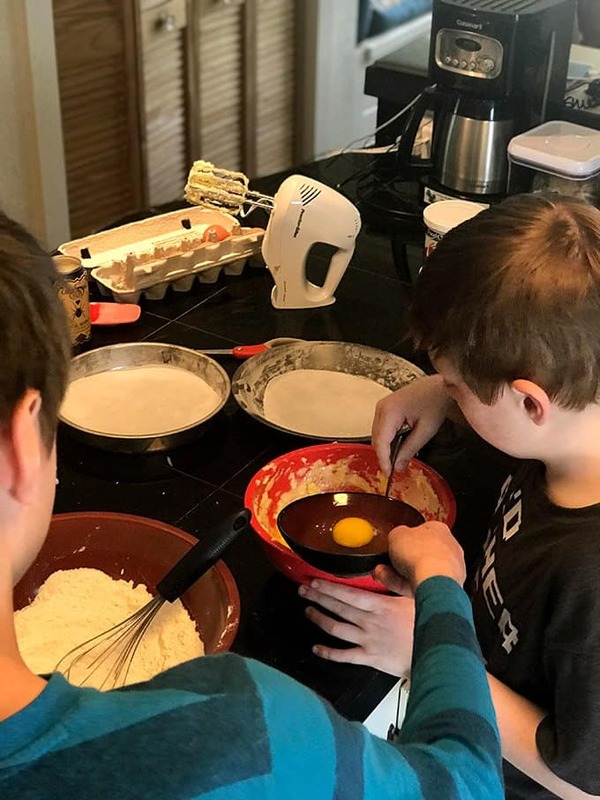 You want to just fold and gently mix the eggs into the rest of the batter until all the ingredients are just combined. Over-mixing cake batter can cause the finished cake to be dense and heavy, more like a pound cake. 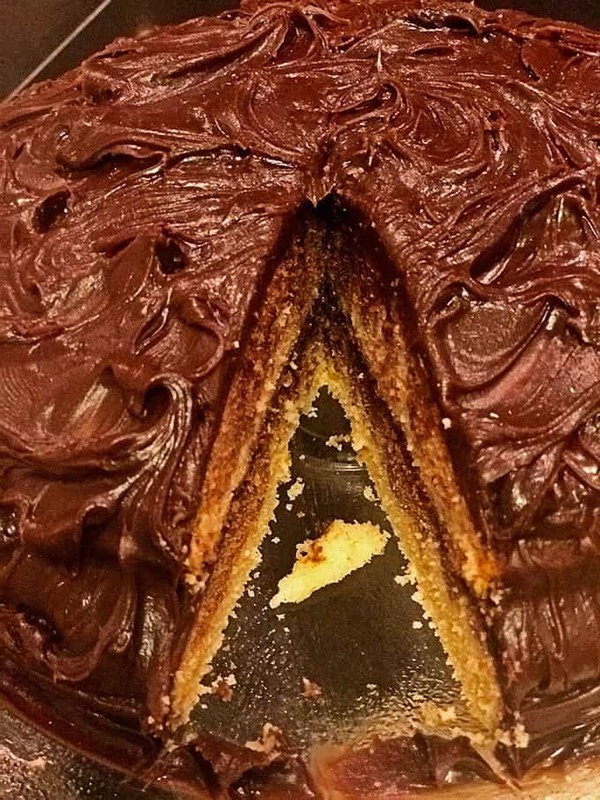 Use a kitchen scale to evenly divide the batter when making a marble cake. When making this marble cake, you have to divide the cake batter into equal halves. The most accurate way to do this is to use an inexpensive kitchen scale. It’s also a great way to teach kids (and yourself!) a little math while working in the kitchen. Once the cake batter is evenly divided, add some cocoa to one of the bowls. Use the white batter as base for the marble cake and then add dollops of chocolate batter on top. Use a toothpick to gently “marble” the two batters. Bake at the correct temperature. Do not repeatedly open and close the door while the cake is baking. Opening the oven door cools down the oven and interferes with the baking process. Closing the oven door an a partially baked cake will cause a sudden increase in air pressure withing the oven, causing your cake to fall in the center. Do not over-bake or under-bake. Use the toothpick test to determine when the cake is done or when it needs a bit more time. Insert a toothpick in the center of the cake an pull it back out If it has batter stuck to it, the cake is not finished baking. If it comes out clean, the cake is done and should come out of the oven. If you wonder how to tell if the cake is done, do a toothpick test. Once this marble cake comes out of the oven, you need to allow it to cool completely before taking it out of the pans. Place the pans on a cooling rack and loosely cover with a kitchen towel. Once they are cool, use a thin knife to carefully separate the edges of the cake from the pans. Now, you’re ready for the good stuff, the frosting! Once the cake is cool, carefully use a thin pairing knife to loosen the sides of the cake from the pan. Make sure the cake is cool before adding frosting. 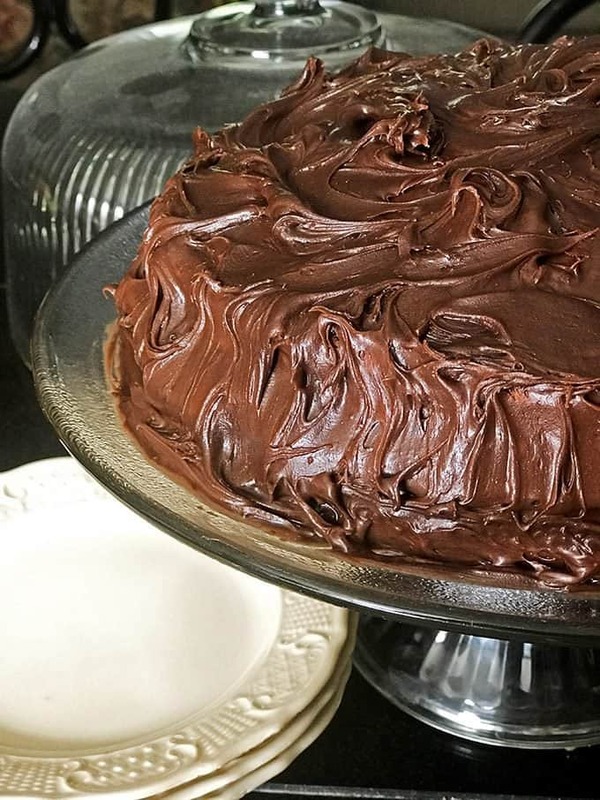 My Favorite Chocolate Recipe and Whipped Cream Frosting from An Affair from the Heart. The Best Frosting Ever from Bunny’s Warm Oven. Classic Cream Cheese Frosting from Take Two Tapas. 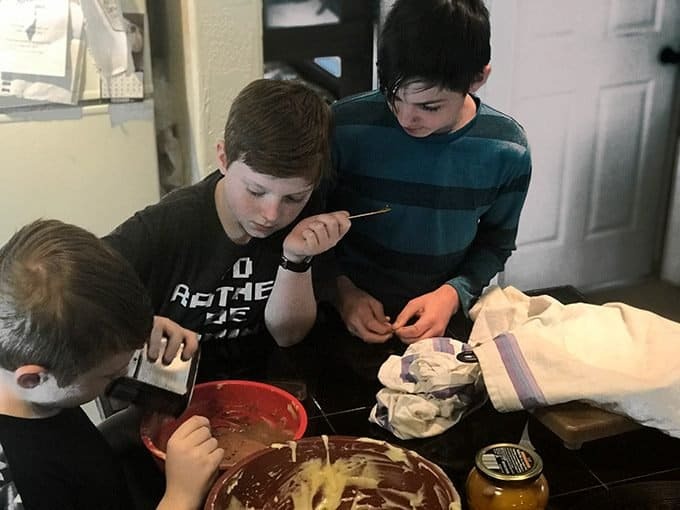 This isn’t the first homemade cake the kids have put together, but teaching them how to make a marble cake was fun for all of us and a really good exercise in teamwork for them. 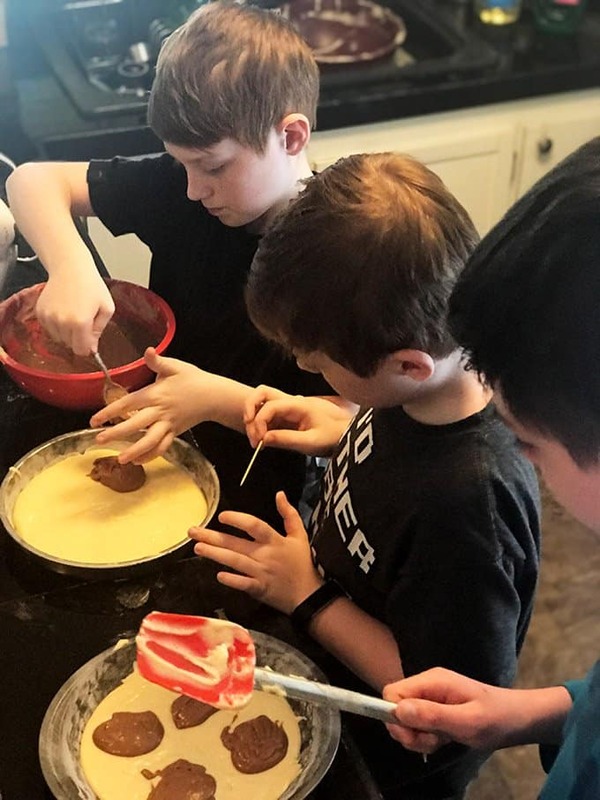 It takes teamwork to make a marble cake! 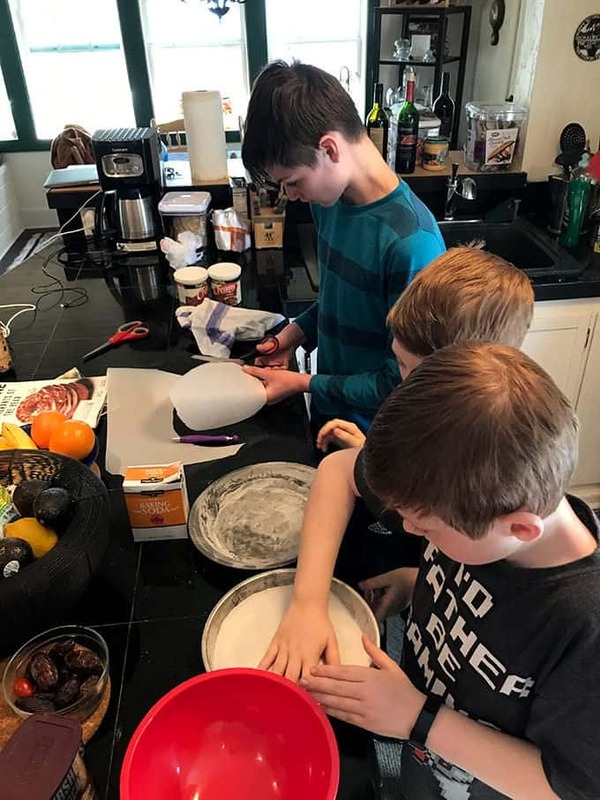 I always try to teach a few lessons besides the recipe at hand and when I asked the boys some things about kitchen safety that they learned from this time in the kitchen, these are some of the points That they came up with. The importance of hand washing. We also talk about food safety especially when using eggs and why cleanliness is so important. Protecting yourself from getting burned. We use oven mitts when handling hot pans. How to properly handle knives. How to work with electrical appliances like a hand mixer. We unplug them before cleaning them with a damp towel after each use and we never immerse them in water. Being aware of others around you. We have to talk to each other to communicate what step of the recipe we are working on. It’s important to “clean as you go”, when working in the kitchen and using a lot of ingredients. Mission accomplished! 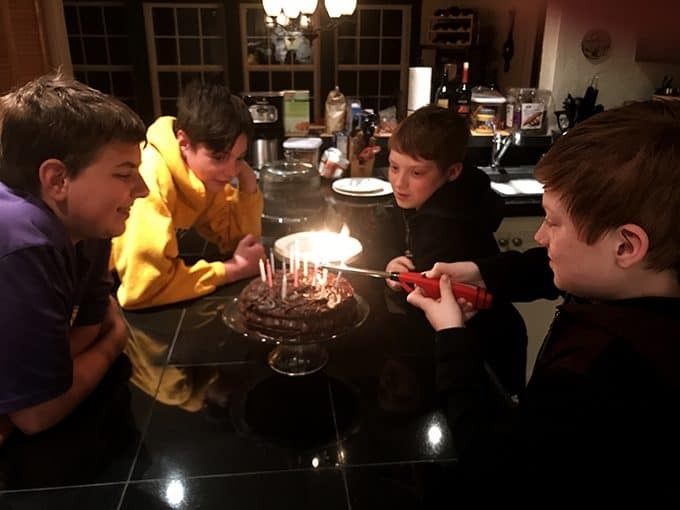 The boys light their marble cake to celebrate their brother Joe’s 15th birthday. This is an easy marble cake recipe, in fact it’s just a white cake with a little cocoa added. Try this marble cake for your next birthday celebration. 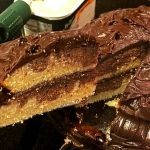 If you don’t want to learn how to make a cake from scratch, this marble cake can just as easily be made from a box, using the same technique. But as the boys would say, what fun is that? I’m with them on this one. 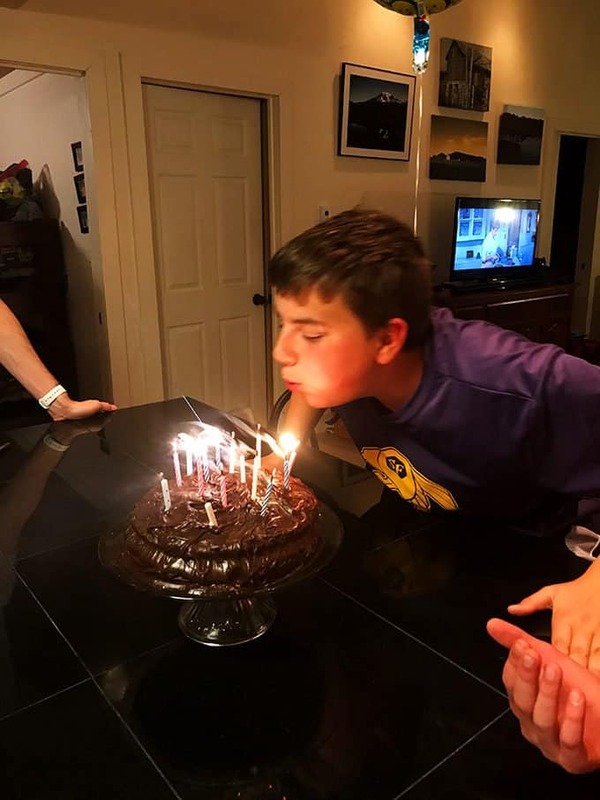 Help your kids make this marble cake for their next birthday celebration! And finally, here’s a great story from Epicurious that features recipes that kids can cook on their own. 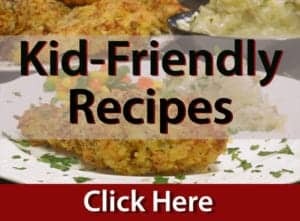 Do you cook with your kids? We would love hear about your favorite recipes to make with them. Leave us a comment below! 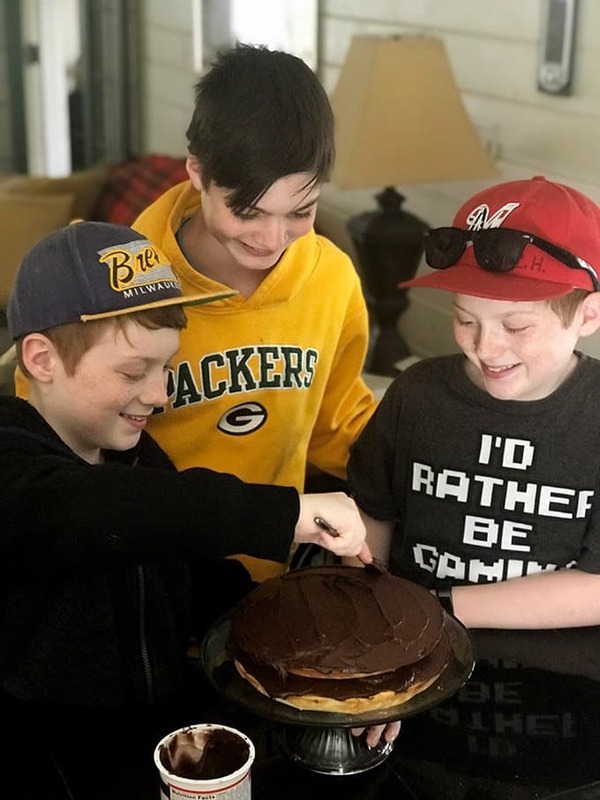 If you want learn how to make a cake from scratch, this is an easy homemade marble cake recipe that even a 12 year-old can make! 1 cup unsalted butter 2 sticks, plus more for cake pans. 3 cups cake flour may use all-purpose flour but expect a denser cake. 1.25 cups milk whole milk or 2% is best. Preheat oven to 350° F. Grease two 9-inch-round cake pans then dust with flour, tapping out excess flour. Line bottoms of both pans with parchment paper. Whisk the flour, baking powder and salt in a large bowl. Use an electric mixer to beat the butter and sugar in a large bowl , until light and fluffy (3-4 minutes.) Use fork to fold in eggs one at a time, add vanilla and stir until well incorporated, taking care not to over-mix. Stir in the flour mixture in 3 batches, using a fork or low-speed mixer. Alternate adding the milk and stir just until smooth. Evenly divide the badder into two bowls. Into one bowl, stir in the cocoa powder. Next, divide the white batter by pouring half in one pan and the remaining half in the other pan. Spread evenly. Use a large scoop or small measuring cup and dole the chocolate batter as shown in the pictures. Next, take a toothpick and gently swirl to incorporate the two batters in each pan, creating a marbled effect. Bake the cakes for about 30 minutes or until lightly golden and set on top Insert a toothpick in center and it should come out clean when done. Carefully remove cakes from oven and place on cooling rack for 15 minues and then use a small thin knife to loosen edges of cake around the pans. Invert cakes onto wire cooling rack, remove parchment paper, and allow to completely cool for about 30 minutes. Plate and frost as desired. 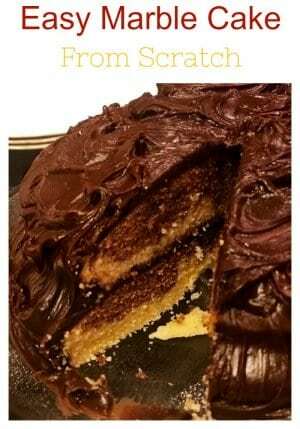 Pin this Easy Marble Cake Recipe for Later! This cake is a work of art and looks delicious. I’d like to say those kiddos are naturals but I know they have amazing parents showing them the way! Thanks Debra! 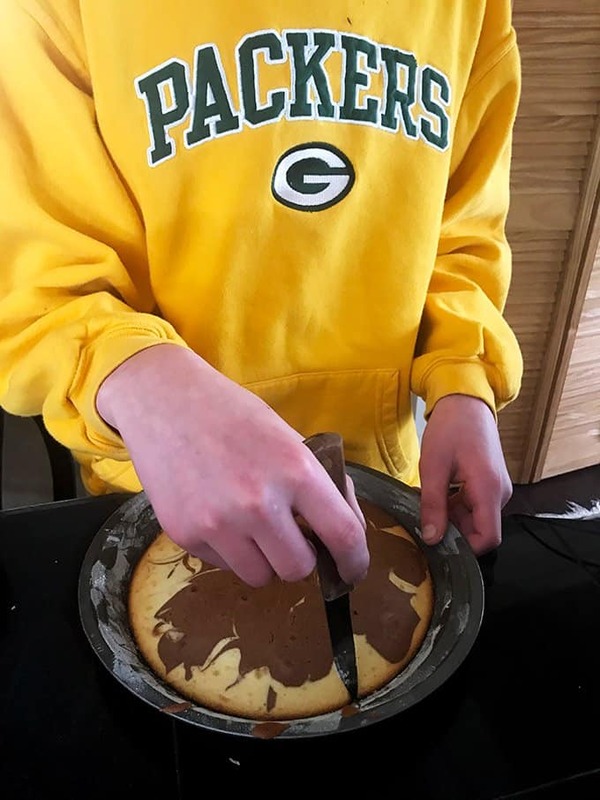 Our cheeseheads are great little bakers and we have a lot of fun having them give us a hand. Thanks so much for the kind comments! Wow! Looks delicious and so impressive! clearly these young chefs have had some top notch instruction! Thanks for all the great frosting recipes and love the video of Scott demonstrating how to grease and flour a bundt pan. Happy Birthday to wonderful Joe! What a beautiful cake and to think that a couple of kids baked this beauty. Kudos to you for giving your kids these lessons that will be so useful later in life. I regret I never took there time to do this with my one children. What happy looking boys you have! Thanks, Milly. 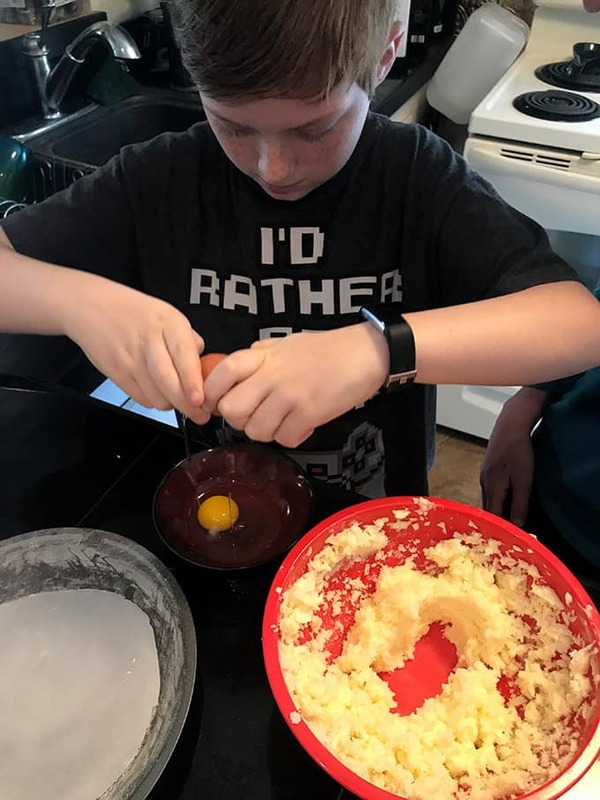 We love cooking with the boys and every once in a while, we are treated to dinner from them!